A transplanted Clevelander originally from upstate New York, Tara (T-Rex) joined Array almost two years ago. 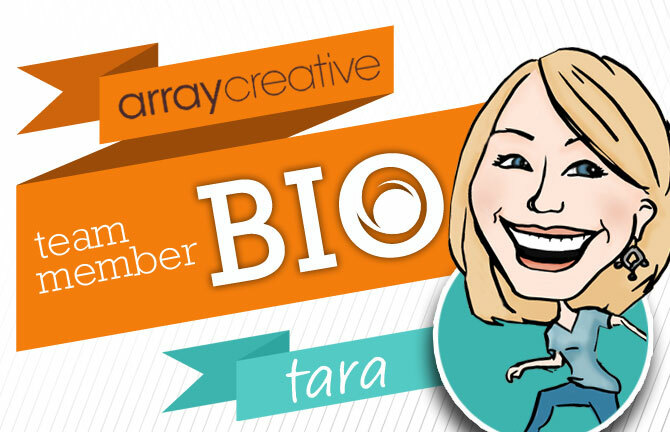 With a Bachelor’s degree in graphic design from Bowling Green State University and an extensive background in packaging and branding, Tara has a wide range of design experience making her a perfect fit for the team. When she’s not at the office designin’ and profilin’, Tara is busy spending quality time with her hubby Eric, being a dog-mom to her corgi pup Zoe and enjoying her favorite Cleveland hot spots – Great Lakes Brewing Company, The Brew Kettle and TownHall in Ohio City. Yes – I’m a fake coffee drinker. In the words of the Beastie Boys, ‘I like my sugar with coffee and cream’. Green. No…Purple! Can I say rainbow? I hate this question. I’m no Barefoot Contessa, but I hold my own in the kitchen! I like cooking, but I LOVE baking. 1/3 of Transformers: Age of Extinction. It. Was. Painful. What was Marky Mark thinking?! The Divergent trilogy. I can’t help it – I like me some young adult fiction! The Outer Banks­­ – it was awesome! Super relaxing and beautiful, just what the doctor ordered. Surprisingly, no! I am a HUGE klutz and have had quite a few sprains.